Walk-Out foundations create an interesting dilemma in when considering wall insulating details. I’ve written extensively on the subject of how to properly insulate basement walls which deals with concrete (and block) walls but I’ve never addressed the occasional wood framed walk-out walls that exist in some many homes today. In this article I want to discuss the options most suitable for insulating these wood framed exterior walls that exist in homes with walk-out basements. Typically we see most wood framed walk-out basement exterior walls insulated with fiberglass insulation and some type of vapor barrier. This detail is used in millions of homes in the exterior walls above grade with some success (the industry is slowly moving away from this detail, but it’s still the most widely used today). So if this detail works ok above grade, why might it not be the most suitable solution in a basement? The answer really revolves around the high humidity levels that typically exist in a basement regardless if there’s a walk-out wall or some other means of egress like a bulkhead. Many times when we remove fiberglass insulation from a wood framed basement wall we find signs of mold and moisture. In most situations we find frost (during the winter) building up behind the fiberglass, on the surface of the exterior sheathing, around nails (from siding and framing). Moisture from the basement penetrates the wall system, hits the back side of the sheathing and exposed fasteners and condenses and forms frost on cold days. This cycle goes back and forth through the seasons and helps promote mold and mildew growth. Spray Foam – One of the best options is to have the framed walk-out walls spray foamed with closed cell foam. The spray foam will not only provide the highest R value but it will also create the tightest wall system preventing air infiltration and moisture movement. This option is the most expensive and also requires a professional installation in most cases. Flash & Batt (Spray Foam & Fiberglass Combination) – A process that’s getting lots of attention and I’m seeing more on job sites is called “Flash & Batt”. 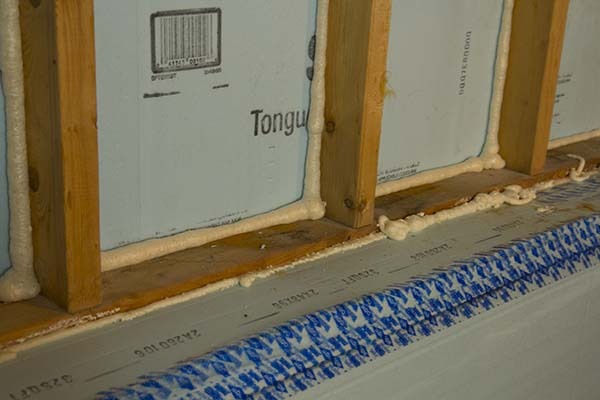 In this detail the stud bays are “flashed” with spray foam, typically about 2″ of closed cell foam which creates both a good starting layer of insulation value (higher R value per inch than fiberglass) and it seals the wall against air infiltration which drastically improves the efficiency of fiberglass insulation (fiberglass significantly loses R value when air infiltrates the wall section). This option is more cost effective than the one above but typically involves a spray foam contractor plus yourself or additional labor for the fiberglass. Foam Board & Fiberglass – Another option is to use a combination of closed cell foam board (XPS Foam Board or Polyiso Foam Board) and fiberglass insulation. This detail is a great option for DIY’ers and general contractors that don’t want to involve a specialized contractor like spray foam applicators. In this approach a layer of XPS or Polyiso foam board are cut to fit in the stud cavity tight against the exterior sheathing. Then the foam is sealed to the framing using canned spray foam. This effectively seals the stud bay from air infiltration and vapor transmission. In order for this to work effectively the foam board should be a minimum of 1-1/2″ thick (2″ preferably). Finally the stud bay can be filled with unfaced fiberglass insulation. It’s VERY important not to install a vapor barrier over the fiberglass as this would create a double barrier trapping any moisture between the insulation and vapor barrier. The exposed concrete foundation wall (above left, and lower) is covered in closed cell foam insulation board. The next step will be to frame a short wall in front of it (it will have a decorative cap on it after, instead of framing the new wall all the way to the ceiling). In this case the lower portion of the wall is insulated exactly as I’ve discussed in my Basement Insulation Article. Each stud bay was insulated first with 2″ of DOW XPS foam board. The pieces were cut so they fit easily into the bay. Then a can of spray foam was used to seal the foam board to the framing. It’s best to do the spray foam last after all the foam is fit so you can use an entire can before it clogs up. Lastly, the remaining stud bay is filled with unfaced fiberglass insulation. It’s extremely important that a vapor barrier is NOT installed over the fiberglass with this detail. It will trap moisture in the stud bay leading to serious problems. Thank you Todd for all the great articles on insulating cement basements! I am working towards finishing my basement. I have a standard split-level mid-western home (cold winters, hot summers). 4 ft cement walls in the basement and another 4 ft of wood wall above that. I would like to frame up 2×4 walls on the inside of the cement and have the “shelf” look around/above the cement rather than framing 8ft studs all the way to the ceiling. I plan on applying 2″ rigid foam insulation to the cement, framing a 4ft wall, run wiring, inserting bat insulation between studs, and finally sheet rocking the entire wall. I plan on attaching the 2×4 wall to the cement floor using Tapcon screws (treated sole plates). The basement windows are roughed in with only 1.5 inches between the top of the cement and the bottom of the rough sill. It would be nice to have a continuous flat shelf the entire length of the wall rather than cutout around windows. My question is: How do I attach the top plate of the new 4ft wall to the existing wood wall above the cement with the limited space between the top of the cement and bottom of the window sill? Lay treated 2×4 “studs” (about 4″ long) flat on the top of the cement wall, and attach them to the top plate of the new 4ft wall and the base of the existing wood wall on top of the cement? That would fill the 1.5″ space between the top of the cement and the bottom of the rough sill. Then insert 1.5″ rigid foam insulation between these “studs”, apply expanding foams between “studs” and rigid foam. Then cap the shelf with a 1×8 board. That would leave me flush with the rough sill, add stability to the top of the new 4ft wall, and allow me to attach sheet rock to the shelf. Do you see any problem with this solution? Do you have better suggestions? Scott – Great question and one that is relevant to lots of homes. First I’d would establish the finished elevation you’re looking for. In many of these details the shelf becomes integral/flush with the finished sill trim on the window. That should give you a bit more space. From that you should leave yourself 1/4″ of space to shim the trim piece. Ideally you get a piece of foam on top of the concrete knee wall to stop cold from penetrating up through the trim cap. Sometimes when I’ve done this detail, I’ll install some blocking over the foam, into the concrete wall with Tapcons, near the top of the short framed wall, then you can tie the wall into the block. This holds the wall tight to the concrete/foam. Then the cap on top is just covering up the foam and nailed down through the front of the framed wall. Make sense? Is there any potential issue with puncturing the rigid foam with tapcon screws as you suggested? Any concern with moisture creeping in to the bat insulation through those holes? In regards to finishing the window trim, I was planning on adding nice 1×8 board painted white on top of the rough sill. That should leave me flush with the finished shelf if I use 1/2″ sheet rock on top of the cap. That was my plan anyway. Scott – The potential is small, but if you’re concerned you can spray foam the block, and the tapcon to seal it. Good luck! Another good article on a relevant issue. My questions relate to existing and future mold adhering to the wood framing, especially the stud section of the framing either touching the damp cement foundation wall or very close to it – say ¼ inch away. How do you prevent existing mold and moisture from reforming on the sections of 2×4 touching or close to the foundation wall? 1. Where a small air space is present between the stud and the wall – say ¼ inch away from the wall – do you recommend spray foam in this space? 2. What about using the new anti-mold paint primer from Rustoleum/Zinsser? Zinsser Mold Killing Primer is a water-based fungicidal protective coating that can be used to paint over and kill all existing mold, mildew, moss, fungi, odor causing bacteria and any other fungal organisms. The Mold Killing Primer contains an EPA registered antimicrobial to prevent the growth of mold, mildew and other fungal organisms on the paint film. Do you or any of your readers have any experience with this product? Todd, I’ve read your articles on basement insulation which were very helpful. I live in the northeast and my basement has a framed walk-out foundation on approx. 40% of the walls, the balance being poured concrete. The basement is dry most of the time, perhaps because of the walk-out, and I don’t want to create a dampness problem. Your opening comments say, “If you’re going to take the time and money to properly insulate the rest of the conventional foundation walls it’s definitely worth spending a bit more money and time on the framed walk-out walls as well”. This sort of implies to me that the big benefit is in the concrete walls. So, I’d appreciate your thoughts on just insulating the framed walk-out portion of the foundation. Is this worthwhile or would it just be like insulating half a wall? Also, I’m wondering about R-values. Adding 2″ insulation may produce an R-value of 9-10. What R-value should I be working toward in Zone 6? Tony – Not sure I understand your question. In the article I discuss the options I’d recommend for the walkout framed walls. In my opinion, it’s best to include some sort of foam in addition to just standard fiberglass. Every State has requirements on minimum insulation values typically listed in the States adopted Energy Code. In many places the R value depends on the entire system of insulation in the home, so it’s not specific to the foundation walls. R10 is a good start, but certainly not as high as would typically be required. In most situations you’re looking at a requirement of at least R19 or greater. Good luck. Todd, thanks for the prompt reply. I’ll look into the R-value aspect as you suggest. The first part of my questions is very basic. My basement is 60% concrete, 40% framed walk-out; all without insulation. I don’t intend to insulate the concrete portion for several reasons. My question, though, is whether it makes sense to insulate the framed walk-out or is that a waste of time and money without insulating the concrete. For example, I wouldn’t insulate a wall without closing the windows. Tony – Absolutely worth insulated the walkout walls. The difference in the basement temperatures from just doing that will be significant. What about the concrete frostwall below the slab? It needs to be insulated with rigid insulation but everyone seems to disagree on which side of the wall? Also, we want to tie the floor slabs (interior & exterior) into the top of the frostwall by with rebar but how do we deal with thermal bridging? 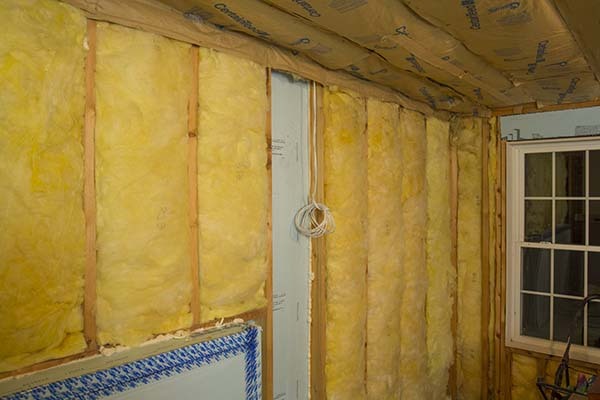 – Insulate the interior of the frost wall below the slab with 2″ foam board insulation. – Insulate below the slab with 2″ of foam board insulation. – The wall insulation should come up flush to the top of the slab (thermal break). This means there is 2″ of foam exposed at the slab surface around the perimeter, not a big deal. This also means that we never tie the interior slab to the frost wall, with a good sub-base it doesn’t matter. This also means exterior slabs can be tied into the wall as the insulation is on the inside. – Finally insulate any above slab concrete walls with foam on the inside as well. Thank you for great article! I have a related question. Can you help to understand the right way? Constantin – I can understand your confusion. These two situations are nearly identical with one major exception. In the case of the foam board against the concrete, that layer is continuous. In the walk-out basement example, the studs interrupts the foam insulation. The discontinuous foam can allow moisture from the outside to get into the stud bay, and that’s why I wouldn’t use a vapor barrier in that case. The other situation is sealed very well from the outside. Honestly, I prefer to use the paper faced in the other example vs plastic which I never use in a basement. I have a summer house on the ocean in Maine that’s built on a concrete slab. The bottom floor is all garage, framed with wood, with living quarters above. We are converting 3/4 of the bottom floor to bedrooms, while leaving 1 garage door in place and keeping that area for a workshop. In all areas except the workshop I recently took your advice and put down a 6mil vapor barrier, foam insulation and Advantech sheets screwed down with Tapcons. I am totally amazed at how well this came out! I also removed all the old moldy insulation from the exterior walls and ceiling, and I now need to re-insulate the exterior walls and the walls that border the new workshop area. The exterior walls are framed with 2×4’s, so I’m just wondering what the best approach would be to insulate. The exterior is pine boards with Tyvek paper under it on the studs, which I see from the inside. Since the Tyvek paper is already a vapor barrier, should I be using an unfaced fiberglass before installing the sheetrock? The other concern are the walls that border the workshop space. The garage door is old and the floor is still bare concrete, so that area I expect to still get some moisture. What do you suggest for those walls and between the ceiling joists? I didn’t see this post when I responded above. So you’re insulated all wood framed walls, not against concrete. Ideally you’d insulate the full 3-1/2″ cavity with foam (2″ and 1-1/2″ thick?). TYVEK is NOT a vapor barrier. It’s an air infiltration barrier. I would install a 6 mill poly over the foam board before drywall. I would use the same detail on the wall adjacent the garage (vapor barrier on finished side). Good luck! Thanks Todd – No concrete walls, just the floor and 1 row on cinder block on top of the slab. I did insulate the row of block with foam and will block it in with studs. The rest is built with 2×4’s on top of the cinder block. I did find out that Tyvek is not a vapor barrier after I posted the questions above, but just so I am clear – by putting the poly under the drywall, the wall can still breather through the other side through the pine exterior? Can I use fiberglass insulation instead of the foam? 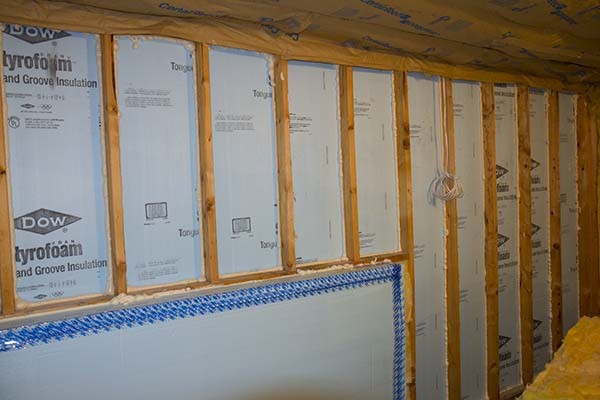 Yes, most homes are built with Tyvek (or similar), wall sheathing, studs bays filled with fiberglass or cellulose, then a vapor barrier followed by drywall. I have a full basement with the backside being a full 8′ walk out block wall with a 4′ frost footing under that. this wall is very large (about 38-40′) and I loose a lot of heat through that wall every winter. Id like to insulate that wall but I want to make sure it is done right. there is also a curtain drain around the outside of the basement floor that moisture can drain into. (typical) I was wondering, do I seal the wall? do I stud right against it? if I use hard foam insulation do I attach that to the wall, the back of the studs or stud against the foam board? leave an air gap between the block wall and foam board? hang any plastic on the block wall? Steve – I’d install 2″ of XPS foam board in front of that wall, and seal all the seams well. Then I’d frame a wall in front of it (the framing can be tight to the foam, which helps hold the foam up). Insulate the stud wall (Roxul is a great product in the basement), do not use a vapor barrier. Hey Todd, thanks for the advice. Would you recommended doing this to all the walls? Or just the walkout wall? Figuring the wall opposite is completely under grade and the two side walls are 3/4 under grade? Or would it be ok to just foam board and insulate the box? I recommend insulating every wall in the basement. The foundation walls need to be done with the foam board detail, the question then is for the framed walls. For those I again like using foam. No vapor barrier for either application. One last question, you said no vapor barrier, did you mean on the block or insulation? Should the batts be unfaced? In the process of insulating a typical Midwest walk out basement. My project is much like Andrew’s in the first comment on this article. One of the basement poured concrete 8″ thick walls is approximately 38 feet long. The first 9 feet of the wall is the full 9 (yes 9) feet high; then the next 14 feet has a 6 foot high concrete knee wall followed by a 4 foot high concrete knee wall for the remainder of the wall. On top of all the concrete knee walls a typical 2 x 6 stud wall has been framed in filled with unfaced fiberglass and of course covered with poly. I’d like to remove the fiberglass in the stud cavities since there appears to be significant air infiltration and replace it with foamed in foam board and fiberglass and cover with drywall. ” slotted edge XPS which is attached using a 1 x 3 furring strip covered by drywall creating about a 3 1/2 inch “ledge” – about 2″ of which would be un-insulated concrete – between the knee wall and the sole plate of the stud wall. Because of plumbing it is nearly impossible to put another framed wall in place where the concrete knee run. Any suggestions on how to handle the “ledges” being created? Can you put insulation on top of the ledge? The rest of the plan sounds good. Should be able to glue 1 1/2 inch XPS to the cement part of the ledge and then out to the foam attached to the cement knee wall without problem. Where I get stumped is how to attach the drywall to cover the foam on the ledge. Is gluing the drywall to the foam enough and then how would you attach the metal edge for the drywall? Most of the time we’ll use a wood cap. I used your method of insulation, 2″ Dow blue foam insulation board installed directly against the outer sheathing in the stud cavity and sealed on the edges with Great Stuff spray foam, with fiberglass batt insulation installed against the foam board, in the framed wall that sits on top of a 4′ poured foundation wall. My intention is to do this to the rest of my framed walk out walls as well. I did this back in August of 2015. I put up a stud wall against the blue foam insulation on the foundation walls that I also installed per your instructions. It wasn’t until after New Years that I finally got around to doing the electrical so that I was ready for the building inspector to look at my work before putting up drywall. When he came, one of the first things he did was to lift the fiberglass insulation to look at the blue foam board installation. Frost had formed on the inside of the foam board, causing the fiberglass to stick to it. I live in Wisconsin. You explained in your article that by not installing a vapor barrier over the fiberglass insulation, moisture wouldn’t form in the wall cavity. But it did anyway. I also installed 2″ blue foam board in the full height wall portion of this room I’m working on, without any fiberglass insulation in it. It remained dry. The inspector said he would go with either: 1)the foam board with fiberglass batts and a vapor retarder installed over that, or, 2)I could add another 2″ layer of blue foam board over what was already installed, with no fiberglass and vapor retarder. I chose #2. As I said before, I followed your installation instructions as you describe them in your article. Could the moisture build-up be due to not installing the drywall right away after the fiberglass insulation? Cliff S.
Cliff – This happened because the drywall and paint were not installed. If you search for the vapor transmission values for latex paint you’ll see that it’s considered a vapor retarder, just like the first option your inspector suggested. The reason we don’t put a full vapor barrier over the fiberglass is to prevent a double barrier that can trap moisture. This doesn’t surprise me at all, it’s a timing thing. Sounds like you waited quite some time before electrical and drywall correct? It was just over 5 months that the walls were insulated before the inspector found the frost. In order to get him to pass the installation, I went ahead and installed the extra layer of 2″ blue foam board insulation. Everything you describe in your article and in your reply make total sense, but after finding the frost under the insulation , I’m a bit skeptical about doing the rest of my walls that way. The doubled-up 2″ blue board is more expensive, but it does give me an R-20 value in the walk out walls. I am going to send a copy of your reply to the building inspector to see what he thinks about the drywall and latex paint as a vapor retarder. At this point, I am stuck with doing whatever he says needs to be done to pass his inspection. Thanks, Cliff S.
good luck…I certainly understand your hesitance. I’ve seen this happen before, and I’ve also taken apart walls that were properly done, drywalled, and painted, and no frost issues. This is complex stuff….never a perfect solution that’s for sure. I have a 2 year old home with a walkout basement. The above grade portions (not covered by block) are framed and insulated with rock wool batts and have a vapor barrier (this was done before moving in). The rest is just exposed basement wall and floor. The exterior foundation had foam insulation installed around it. Do I still add foam insulation to the block walls or will that trap moisture? And if I don’t add insulation, do I really just build framed wall right up against the block without insulating it? I see many ways of doing things but often it says not to insulate the inside block walls if they were insulated outside. This seems like I’m losing too much heat if I don’t insulate them but don’t want to cause a moisture issue. Greg – It’s absolutely ok to insulate both sides. Concrete block and concrete in general are always full of water at the microscopic level. In fact, concrete materials that are completely submerged in water will be stronger over the life compared to concrete that is not. Fear not …. interior foam insulation will not cause a problem. Good luck. Does the 2nd option, Flash & Batt, require a vapor barrier (sealed plastic over the fiberglass)? I had a professional give me a quote and he told me they would spray 2″ of closed cell foam, then install fiberglass batts, followed by sealed plastic. Why is this option OK for a vapor barrier but option 3, Foam board & Fiberglass, states do not install a vapor barrier. Steve – Good question….was it truly a vapor barrier or a some type of semi-permeable barrier? I would NOT install plastic as this basically locks the cavity and won’t allow any drying. Thank you for this very informative article. I am hoping you can help with some guidance in my situation. I am a hesitant do-it-yourselfer who often has bad luck, so I want to ensure I am doing the right thing here. I recently moved into a 10 year old house in MA and found small spots of mold building up on the fiberglass of the framed walls of our walk-out basement. The basement is unfinished, and the 1/2 and 3/4 walls that are sitting on the foundation just have unfaced fiberglass and a plastic barrier stapled over it. I am not looking to do the whole basement right now, but I want to fix the fiberglass/mold situation until we eventually finish the entire basement. If I were to just install the 2″ XPS and fiberglass, can I leave the foundation below the walls uninsulated or is the insulation of the foundation an integral part of this? Also, is it okay to just leave the internal fiberglass insulation exposed to the rest of the basement, or is installation of some kind of barrier necessary? I am hoping to essentially leave the basement in the same condition as you have in the last picture of your article, but I am concerned that other comments have noted frost issues in cases where drywall/paint was not applied over the insulation (or maybe even basic codes I am not aware of that may say not to leave exposed fiberglass). Any help you can provide is GREATLY appreciated and thank you again for this information! You are asking some great questions. In your situation you can definitely leave the concrete alone until such a time that you want to finish the basement. That won’t affect the framed walls at all. It’s likely you’re finding issues because the plastic vapor barrier was not properly sealed, allowing moister to get between the plastic and sheathing. Be very sure all the plastic is sealed well when you’re done. The code question is tough. Typically it’s not acceptable to leave plastic vapor barrier or exposed fiberglass in a living area because it’s a fire hazard (flame spread issue). I’ve seen LOTS of times where it’s been allowed in “unoccupied” basements. It really is a question for the local code enforcement official. Thank you for taking the time to respond, I really appreciate it! I am, however, a little confused by your comment to make sure all the plastic is sealed well when done. Is this not correct and should I be applying a layer of plastic somewhere? Travis – Not exactly how it works. – It’s likely that if the plastic was not sealed, that moisture from the interior side (basements are very damp) got into the wall cavity and condensed on the back of the cold plywood. We see this a lot! – New system: your plan works fine, if…big if…you install the drywall, tape it, and paint it (the latex paint is a semi-permeable vapor barrier). However, that isn’t necessary if you’ve got enough foam insulation that’s sealed to the framing. If you install a minimum of 1-1/2″ of foam, seal that to the framing, then you’d be ok without the drywall as far as moisture goes. Thanks for the great info. We have a half wall foundation that sticks out 3″ and have decided we DO NOT want to build shelf, and instead build one continuous wall. The issue is we will have approx 8.5″ (3″ foundation + 2″ rigid foam + 3.5″ 2×4 frame) of open space from where the original 2×6 end that are sitting on the frame to where the drywall will eventually go up. (Right now the 2×6 are filled with batt insulation with vapor barrier by builder). Is that space a problem? How would you suggest handling that? Thank you! Nathan – I’d remove the batt insulation, insulate the stud bays with foam board and tie that foam into the foam on the foundation. Then just frame straight up. Thanks for the reply Todd. So there is no issue with having about 8″ of space just open between the upper foam board and drywall? Not at all….the air space is actually good. Todd, I like all your articles. Thanks. Can XP be fitted like this in currently unfinished my basement between the upper floor joists to keep warm air from my upstairs living quarters from being pulled down to my unheated walk out basement? What about using Polyiso for those joists? Humidity is a problem here in Georgia thus the reason I may do my basement wall cavities as you show above. Thanks!!! Yes you can use XP to insulate the floor. You mentioned I’m the article about nails entering the stud cavity from the outside siding, etc. How do you apply 2″ foam board with existing nail protrusions? Some of them we bend over, but most we try to get the foam to encapsulate them. Use a block of wood to tap the foam onto them. Ideally there are not too many, as the siding hopefully was nailed into the studs. I’m about to insulate and frame a walk-out basement and am still somewhat confused. In this article you recommend essentially cut-and-cobbling the rigid foam between the stud bays, but in your “DIY Basement Insulation Video” on youtube (https://www.youtube.com/watch?v=iRXnHRsAgGw) @ 4:00 you opt to rigid foam right over the studs with the fiberglass insulation left in place (after removing the poly covering). Is one method superior to the other? I would prefer to install the rigid foam from the slab all the way up to the joists, rather than all the labour involved in cutting/cobbling and spray-foaming between each and every stud. In some spots I will have the ledge issue as you had in the video, but in other spots the studs are flush with the cement wall so I could use uncut pieces of rigid foam from slab to joists. Is there any concern with leaving the fiberglass in the 2×6 studs and then attaching the rigid foam over it as you do in the video? Is there a risk that moisture would get in between the OSB sheathing and then just sit in the fiberglass batts since you’ve created a vapour barrier with the 2″ rigid foam on the other side? I would prefer to leave the fiberglass in for R-value if this is not an issue. Thanks so much for any clarification you can provide. Terrence – Sorry this is confusing. Several different situations going on in the article and video. – The walkout framing is very different that insulating adjacent to the concrete. When it’s just studs and sheathing (the walkout framing above concrete), I opted to fill the stud bays with foam then fiberglass. This simulates a flash and batt approach that’s popular right now (spray foam thin layer to seal, then fiberglass to up the R value). – I always use continuous foam against any concrete, then optional fiberglass in the stud bays. – In the video, you see a short section of walkout wall that’s adjacent to a tall section of concrete wall. In this small section, I insulated the concrete wall with foam board, and the stud bay has foam, fiberglass, air space, then the foam is continuous from the wall below. It’s a unique situation in that location that I was struggling with. Just came across this but I have already finished the job. We have a split level home that is mostly above grade. On the back wall I nstalled three windows and a door. Then I sheeted, wrapped, fanfold, and sided. On the inside I fiberglass, plasticed over, then mold resistance rock. Did I go too far and will it fail? Wood framing or concrete wall? Foam board is EXPENSIVE! Is it OK if I just put fiberglass in the stud bays above the concrete and pass on the foam board? If yes, what kind of fiberglass do I use and do I put a vapor barrier over it? Matt – Foam board isn’t as expensive as cleaning up a mold problem. I’m not trying to be smart, I’m trying to save home owners the incredible expense of dealing with a mold issue. If the stud bays are NOT in contact with a foundation wall, then yes you can use fiberglass. However, basements are VERY damp locations, and often times have vapor problems that are not always seen in upper floors. Good luck. This is a bit confusing as the guy in Wisconsin had frost issues on his 1/2 wall, but you said it was because he had not finished the wall with drywall and paint. So IF I don’t want to finish the 1/2 wall, just insulate it with no intention of putting up drywall and painting it, then do I need the vapor barrier using fiberglass batts with paper? The basement is tough…the humidity levels are usually really high. So, any vapor that manages to get through the insulation and barrier will easily condensate on the back side of the sheathing. It’s a really tough detail…on one side of the coin if you use paper faced insulation it can “breath” a bit…allowing some drying…but I feel like it will allow that vapor to get through easier. A poly vapor can prevent the vapor from getting into the cavity when properly sealed…but when vapor gets in it seldom dries…So…the best approach is using foam wherever possible in the basement. My wife and I built a home 2 years ago with the north wall of the basement being a walkout. The foundation for this wall is 8 inches thick and 4 feet deep. It is part of the floor and it is constantly moist during the winter months due to condensation. The north wall has the 1 inch of foam board on the inside of the foundation, but the outside has no insulation. So basically, we have a 4 inch strip that is about 60 feet long that is moist and we just cant get it to dry out. We have a dehumidifier built into the heating system and have also run fans, etc for weeks at a time and it stays moist. The builder did not insulate the outside of the north foundation wall, nor did they paint a water barrier onto it. Do you think that doing this would solve the problem? James – Without seeing the basement it’s hard to know exactly what the issue is. However, my thought is this. You’re basement likely has a high humidity level (have you measured it?). That damp air is hitting that un-insulated concrete stem wall and the water vapor is condensating. What you need to do is insulated it with 2″ of foam board. We built our house in 2014 and are getting around to finishing the basement. We have a walk out and 1 framed 2×6 wall. When the house was built we had unfaced fiberglass insulation put in the 2×6 wall and then covered it with a plastic vapor barrier, mainly to avoid the kids getting into it. This was the wrong idea as moisture built up and we have some mold growth. We have since taken the barrier down and insulation out. This 2×6 wall does have the fan fold insulation on the exterior of the wall on top of the Tyvek. We are wondering what the best solution would be for this wall, foam? Or one of the options above? Also what would be the best option for our other poured concrete walls. If we wanted to insulate the ceiling for noise would you suggest foam or a acoustic type insulation? For the framed walls, you need to clean the mold, dry it out very well, and then my recommendation is a layer of foam, sealed well with can foam, then additional fiberglass for R value. Good luck. This is a very useful article. I have a walk in basement right by the ocean with some concrete wall (proposing continuous EPS with foam on edges with an interior stud wall and no vapour barrier) and studded sections where i am proposing EPS between studs with foam edges and again no vapour barrier. The floor has had an interior draining system installed (thermacrete). All enclosed with drywall. Grateful any advice you might have. Honestly, if it’s not 2″, I won’t recommend it. Now, you can install two layers of 1″ for the same effect. I live in a home owner build home constructed in 2000 in Alaska, which we have lived in for 3 years. Shortly upon moving in we had saturated carpet in ge basement. The basement is 4ft block walls ( block is 99% below grade)on top of an I heated slab, atop the 4ft block are 2×8 “conventional” exteriors that have a pressure treaded bottom plate filled with faced fiberglass insulation. When I did a small exterior excavation I found the builder had first put rtech insulation against the slab then wrapped it in ice and water shield. The sheeting on the 4ft of wood construction on top of the block consist of 7/16osb, then housewrap, then the preprimed 8”o.c. 4’x8’ sheets of t1-11. The interior had Sheetrock and vapor barrier on the wooden construction and a glued on hard board over the block. When removing some Sheetrock I found that the exterior sheeting was molded in some areas as large as 4×4 feet and some smaller to the time of 1×1. This was more or less sporadically found through this downstairs basement level of the home. After replacing the exterior sheeting would following your guidelines for insulating a walkout basement take this construction from incorrect to correct? Can I follow the walk out basement insulating instruction with the exterior insulation/ ice and water shield? Is there a better way, perhaps not insulating the interior of the block and just using the blue board inside of the stud bays. If that were the case could I then for the block out with a 2×2 all weather wood wall with no vapor barrier? Hi Todd, thank you for your article. I am wondering if you might be able to provide your expertise to my situation? My house is in Georgia where it is really humid. I have an unfinished walk out basement similar to what is pictured in this article. Currently, there is no HVAC installed in the basement and I do not plan on finishing it for a few years. My question is, would it be worth it for me to install only non faced batt or faced batt insulation for the time being? I do not think I can afford to get the foam at this time and I am not sure when I might be able to. I got a quote from a company and the cost difference is 2.5 times higher. Also just to confirm, you do not recommend installing any fiber glass insulation without using the foam board inside of the wall directly on the siding first correct? James – I would not install fiberglass directly against the siding in a basement. The humidity levels are just too high. Hi Todd. My walkout basement simply has open fiberglass between the studs. I also have cats who like to get into it, and the basement is used for some playtime. What is your recommendation for insulation and covering the walk-out walls, bearing in mind that I’m not interested in fully finishing the basement? I’m not really looking into putting drywall up if I can avoid it. I was thinking the foam board plus unfaced insulation, but then what do I cover that with so cats and kids don’t get into it? Thanks for putting up this article on the subject as it is what I’m trying to tackle in redoing our basement and almost all basement wall videos deal with a whole wall, not walk out partial wall. However it doesn’t address my specific goal of keeping the space taken to a minimum/avoiding having to do 2×4 framing in front of the foundation wall. My challenge is that the original one-off builder, who used off-the-street labor and not plan so I have hat channel nailed to the concrete with half-hazard 1/2″ peices of foam randomly glued between them. Drywall was directly glued to the top. So essentially zero insulation but now a lot of nails. As I have to cut those out and remove the hat channel, I’d like to avoid making more penetrations into the cement and thought about gluing z-channel to hold the 2′ foam board. Buuuut after weeks of searching I just came across this foam+studs product from “Insofast” that seems to do exactly what I want with fewer issues and with extra benefits of offering drain channels and places to run power through (not that I need that so I’ll probably do the 2.5 EXe). I can’t speak to it yet as I’m just ordering it now but I thought I’d drop it here as an option to check out for those who come across this article and have similar goals. Your blog is amazing, thank you for investing in the DYIers out there and empowering us to feel we can do things ourselves! I have a question about installing the XPS 2″ foam onto my foundation walls. There is a few places where the sill plate(s) (which is actually three 2X4s put together) hangs over the edge of the foundation concrete by about an inch. How do I navigate this with foam boards? Do I still run the board all the way up to the floor joist accounting for the inch overhang and have it be not touching the foundation wall in places and be way out of plumb? Do I run it up to the sill plate number 1 and then stop there and do the rim joist and leave the sill plate(s) with no foam? Do I go up to the sill plate(s) and cut another piece to cover the sill plates and then do the rim joist separately? Any help is much appreciated!!! Thank you for your time and expertise!! Either cut back the plates or shim the foam out past them. Hi Todd, I have a walkout basement with a dirt floor under a recent addition in RI. My plan is to place a plastic vapor barrier and crushed stone on the floor.For the half walls(sides) and full wall (walkout side) I plan to the rigid foam with unfaced fiberglass over it. My plan was to then place plywood up on walls (used for storage). My main question is what would you recommend to insulate the floor joist of the room above? I have 12″ TGI’s for joist. Should i use rigid and unfaced fiberglass here as well? I would also place plywood over this as well to prevent damage and rodents. Glad I found this article. My 1/2 wall is made of 2×4’s. If I install the 2″ rigid foam, I’ll only have 1 1/2″ depth for the fiberglass batts. Will compressing the fiberglass behind the drywall be a problem? Hi Todd, I’m in upstate NY, zone 5. I have a walk-out basement with 8′ tall poured walls all the way around. Walls are approx 8″ thick and uninsulated. My plan is to use two layers of 2″ XPS, overlapping the seams for R-20. My walls are surprisingly plumb so I think i will just attach strapping to the XPS and mold resistant drywall on top of that. I have two questions. 1st, Should I attach a strip of OSB or plywood to the underside of the floor joists where the XPS will go to act as fire blocking? I’ve seen this in some details. My main question is how best to insulate the basement door opening. do I remove the door and wrap both layers of XPS around through the opening to the exterior? Or just the 1st layer of XPS? Either way I am reducing the width of the door opening by 4″-8″. Right now I have 72″ prehung steel doors in a 74″ opening. I’d rather not replace the doors with smaller ones if I don’t have to as they are quite expensive. Would it be ok to insulate the interior up to the door opening and then wrap around with the 1/2″ drywall for a finished look or is this asking for trouble? I appreciate any suggestions you can offer and thanks for all the great info on your site! Not exactly sure about the fire break detail you are describing, typically I leave those details to the local inspector depending on what he/she want. Is the door set directly into the concrete? If so the steel frame is likely to get really cold and cause some condensation issues. You can try running one layer up to the frame, see how it works before installing the drywall. Great article! So my builder first installed insulation.just as you described frost, moisture and mold. So he tore out and replaced with flash and batt but covered with vapor barrier low and behold moisture again not as bad but still soaked the lower portion s of the insulation. So correct me if I’m wrong I should open the walls, dry out replace the bats and no vapor barrier this time. I want to cover with wallboard can I use basement board or should I go with greenboard? Clearly you’ve got a lot of moisture down there. I’d tear it out, dry it out, then install foam board…not fiberglass. So what type of wallboard would you recommend? My local builder supply has a basement board. Or would you suggest going with green board. I haven’t seen the basement board so I can’t comment on it. Really depends on the “dryness” of your basement. Do you have a vapor barrier? If not that’s the issue…even 28% humidity will condensate when it penetrates the insulation and hits that ice cold sheathing. I’ve done the 2″ XPS foam board, spray foam and unfaced fiberglass insulation in stud bay cavities. Initially, I thought I would drywall, but want to wait to finish this space in my basement. I feel it should still be covered due to the insulation being exposed. Would simple paneling work? I don’t want to worry about the mold problems I previously experienced when the wall was the stud bay cavities, unfaced fiberglass insulation and a plastic vapor barrier. Paneling will help, the idea is to have a flame spread deterrent….really depends on local codes.